Red Hot Make-up was created by Lisa Martines, a well known, Los Angels based make-up artist and stylist. She not only does make-up professionally, she's also a certified skincare and makeup specialist and she's launched her own make-up line! So when I came across her make-up and saw the little she-devil, I had to try it! The Red Hot Makeup line includes mineral foundations made from 100% organic crushed minerals, baked blushes and eye shadows, retractable, slanted-tip “precision” eye and lip liners; and what they refer to as the ULTIMATE lip gloss – for the perfectly NAUGHTY pucker! Unleash the naughty girl in you with Red Hot Make-up! Lisa recently sent me full size products to review and here is my review. Red Hot Make-up Mineral foundation is a flawless, weightless, sheer to medium coverage foundation made from 100% pure, crushed minerals. It's completely free of parabens, dyes, preservatives and other chemicals. I love this powder because it looks completely natural and and the color in "natural" blended into my medium skin perfectly! It looked like I was wearing nothing, only better. It didn't cause any breakouts, itchiness or other reactions and my skin looked luminous. Available in three natural looking shades that blend with any skintone. Red Hot Tip: Always apply your foundation to clean, moisturized skin. It’s also important to wash your foundation brushes every so often to avoid spreading bacteria and getting a breakout. Red Hot Make-up Kubuki brush picks up color quickly and covers completely and evenly. I just love the she-devil logo on the kubuki brush and all the make-up products! Red Hot Tip: This naughty little brush can be used with your foundation or your baked blush and highlighter. Just swirl it around and apply. It’s small enough to carry along with you and durable enough to wash.
Red Hot Makeup Baked Blush and Highlighters go on beautifully, creating a luminous soft glow. After baking on a terracotta tile, their color-infused liquid transforms into a creamy, luxurious powder, rich in color. You'll just love the glowing affect! Red Hot Tip: Apply the highlighter with your finger to add a luminous glow to cheeks and eye brows. 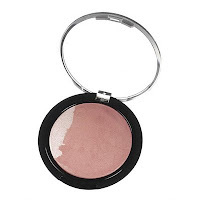 Baked blush and highlighter is available in three gorgeous shades. Red Hot Make-up Lip Liner keeps your lips in line, creating fullness and preventing your lipstick from feathering and fading. I love this lip liner works as a lipstick and lip liner in one! Now you never have to worry about matching your shades. With four beautiful shades, your sure to find the one for you! Red Hot Tip: Just add a little of the Lip Shine Lip Gloss on top and you have the perfectly pretty pucker. 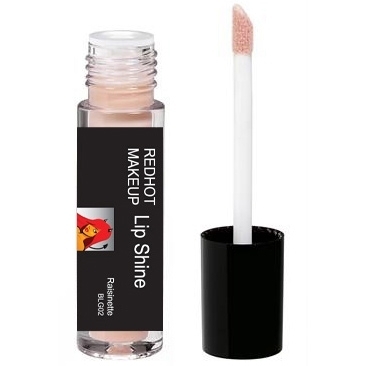 Red Hot Make-up Lip Gloss is delicious, luscious and the perfect combination of shine, color and moisture for your pout! This sheer, shiny gloss is infused with lip-pampering vitamins and goes on very smoothly. Red Hot Tip: Wear alone or over Red Hot Make-up Lip Liner. You'll love the colors and their available in four naughty shades.